1 small piece (1/2 a pea size) of Asafoetida or 1 teaspoon of Asafoetida. (Piece of asafoetida, is my special Asafoetida, which we bring from North of India. It has a very strong and a Intense flavour). Wash the coriander, green chillies and the ginger very nicely in normal tap water so that all the dirt is removed. Drain the water using a colander. Let it sit in the colander for 5-10 minutes so that all the water is removed. Roughly chop the green chillies and the ginger to 1/2 an inch piece. This helps in even grinding of the chutney. Now simply Add all the ingredients, excluding water, in the mixer and grind it to a smooth paste. Add water only if required. (I first add a bunch of coriander, then the masala’s and then the coriander again, so that the chutney grinds to a smooth paste). When serving add a dash of lemon juice to it. If adding Kairi(raw mango), lemon juice is not required. I store this in an air tight container in freezer. When I require it I simply defrost it. 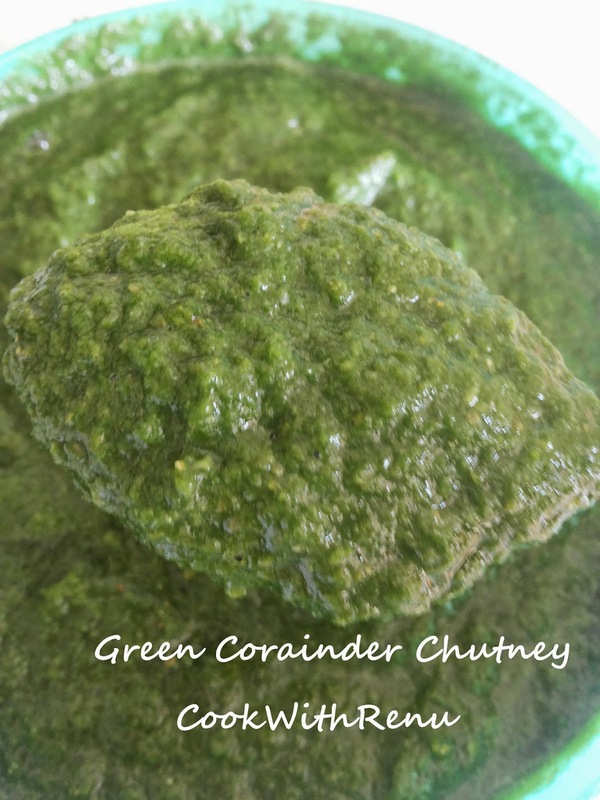 One can add onion, palak or cucumber to increase the volume of the chutney. I have used onion, yet to use palak or cucumber.